Mariel Hotel은 인테리어 디자이너인 카림 차만(Karim Chaman)이 설계한 현대적인 부티크 호텔입니다. 호텔은 리마 내 미라플로레스 지구에 위치하고, 수공예품 시장에서 단 1블록, 케네디 공원(Central Park Kennedy)에서 2블록 떨어져 있습니다. 모든 객실과 아파트에서 무료 Wi-Fi를 이용하실 수 있습니다. 숙소는 2016년 전면적인 보수 공사를 마쳤습니다. Mariel Hotel의 객실은 따뜻한 색상으로 꾸며져 있고, 에어컨, 난방 시설, 32인치 평면 케이블 TV, 전화기, 책상, 옷장을 갖추고 있습니다. 룸서비스도 이용 가능합니다. 아파트는 호텔 옆에 위치하고, 침실 2개와 욕실 2개로 구성되어 있습니다. 아파트에 식사 공간과 각종 시설이 완비된 주방이 있습니다. 매일 다양한 종류의 빵, 과일, 주스, 요구르트, 시리얼, 달걀, 커피 등으로 구성된 조식 뷔페가 무료로 제공됩니다. Mariel Hotel 레스토랑은 페루 및 세계 각국의 맛있는 음식을 선보입니다. 투숙객은 라운지 바에서 음료를 즐기실 수도 있습니다. 숙소 전역에서 무료 고속 Wi-Fi를 이용하실 수 있습니다. 숙소는 세탁, 환전, 관광 정보 안내 서비스도 제공합니다. 투숙객은 구내에서 추가 요금으로 렌터카 서비스도 이용하실 수 있습니다. Mariel Hotel은 조용한 골목에 위치하고, 호텔에서 각종 레스토랑, 바, 상점으로 쉽게 이동하실 수 있습니다. 5개 이상의 객실 예약시 총 예약 금액의 50%를 선결제하셔야 합니다. 호텔 도착 시 10%의 서비스 요금을 지불하셔야 합니다. 예정된 체크아웃 날짜 이전에 체크아웃하실 경우 추가 1박 요금 및 별도의 세금이 청구됩니다. 현지 지방세법에 따라 페루 시민과 페루에서 60일 이상 체류하는 외국인에게는 18%의 세금이 부과됩니다. 18%의 추가 요금(IVA)을 면제받으려면 입국 신고서 사본과 여권을 제시하셔야 합니다. 두 가지 서류를 모두 제시하는 경우에만 세금이 면제됩니다. 해당 서류를 제시하지 않을 경우에는 요금이 부과됩니다. 인쇄된 청구서가 필요한 외국인 비즈니스 여행객에게도 페루 체류 기간과 관계없이 18%의 추가 요금이 부과됩니다. 이 요금은 총 예약 요금에 자동 합산되지 않습니다. 모든 투숙객은 체크인 시 사진이 부착된 유효한 신분증과 신용카드를 제시하셔야 합니다. 모든 별도 요청 사항은 체크인 시 가능한 경우에 한해 제공되며, 추가 비용이 부과될 수도 있음을 안내드립니다. The hotel was not accommodating, My guest had a change of flight 3 days early and i called up the hotel to check if they have any rooms dues. they had no rooms for that 3 days and they do not agree to cancel the booking since there was no cancelation inflexible and no thought for the guest. disappointing since the same guest stayed there for more then 4 occasion yet the hotel management choose to exercise the cancelation policy . absurd will never book this hotel again. Just a 8 minutes walk from Stop 3 of the airport express. The rooms are clean, and nice. The staff are friendly, and willing to help. Short walk to Park Kennedy. Good place to stay. I love the location. It is very close to Kennedy Park. Staffs are friendly. And it's worth what you paid for. The only complaint I have is the window view isn't the greatest. But its worth what you paid for. clean , nice and convenient location. Excellent hotel, nice location, good breakfast and service, friendly staff, clean, wi-fi. Not luxurious but supplies greatly your basic needs. clean, good price with good location. 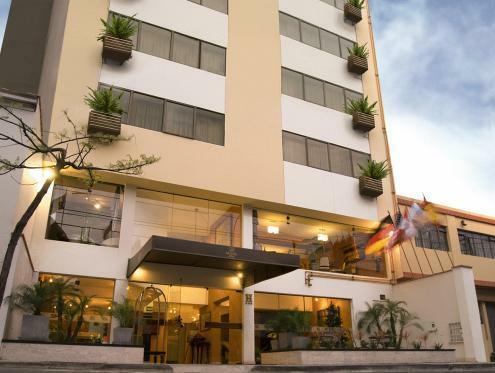 this hotel is located on a quite street, within 5 mins walk or less, you will be on the main block. the market is right cross the hotel, and you can find anything you want to bring home. there is a travel agency right next door and can help you arrange all activities in lima or peru. the service is okay, breakfast is okay. overall, nice hotel to stay, nothing bad to review. Surprisingly good value for money! Room was not very spacious but not in any way cramped either. Professional and effective staff. Clean, large windows, good view, and well made. Ordinary breakfast selection. Free safe to store valuables and free use of wi-fi. A little off center, though a mere 5 min. walk, but the rate is 40-50% off compared to a 4-star option nearby which, at least for me, did not have anything more to offer. located 10 min from kennedy park and many shops. Calle de las Pizza is a 15min walk.Hotel breakfast is just ok however dinner quite good. Nice barkery across the street. Large casino 3 min away. Free WI-fI but lobby computers have hourly fees. For the price, I found this hotel served my needs. It was always clean and the bartenders/waiters were some very nice people. One even called my room to reminded me that breakfast was included just in case I had forgot and I did. Walking around at night, like any big city, one should alway be aware. At night it gets dark near the hotel so I suggest to have the front desk call for a taxi. I never did but I only had myself to worry about. Honestly, we were impressed with the overall value and can't think of anything that dissapointed us. My wife and I stayed at the Mariel for two nights at the end of Peru visit and have nothing but good to say. The staff were friendly and helpful, the room was clean and the bathroom was good with lots of hot water. The location is great, just 2 minutes from Kenedy and Central Parks. All in all a great hotel with a great location. The Location of the Hotel is perfect. It is quiet and near to the entertainments in Mirafolres Center at Ovalo and Av. Larco and Diagonal. Some of the Staff(Receptionists) are not really helpful, others very friendly. If you speak spanish, you got an big advantage. The Rooms are to small even for a City Hotel. Anyway just for sleeping it is OK.
Das Personal ist nicht sehr freundlich. Die Zimmer sind sehr klein, bieten aber alles was man braucht. Das angebotene Frühstück ist eher dürftig. Die Lage hingegen ist optimal, da alles in Gehdistanz erreichbar ist und doch sehr ruhig gelegen. Für einen Aufenthalt von nicht mehr als 3 Tagen ist das Hotel aber empfehlenswert. Excelente ubicación, habitación reformada impecable, y buen precio. Justo lo que buscaba para Lima que paso poco tiempo en el hotel pero me gusta estar estar en un sitio bueno. es una muy buena opción, dado que su precio es razonable y se encuentra en una zona de miraflores muy cerca de todo, el personal es excelente, siempre dispuesto a ayudar. buen desayuno y el restaurant prepara muy ricas comidas también dado que en más de una oportunidad almorcé o cené ahí.